Over the next few weeks we’ll be publishing a three-part blog series centered around Cullen Diesel, the Detroit Diesel and MTU distributor for BC. Cullen Diesel mechanics are factory trained and certified in Detroit Diesel and Mercedes engines, with experience in working with all types of diesel engines, including those in the marine, mining, construction and industrial sectors. 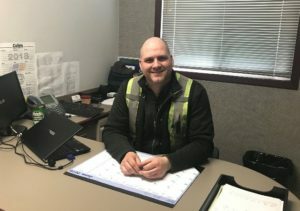 Dennis Miskow is the Branch Manager of Cullen Diesel’s Vancouver Island, BC operations. Dennis’ career with Cullen started over 20 years ago, when he was first hired as an apprentice heavy-duty mechanic. Dennis sat down with VMAC to discuss Cullen’s fleet, and his decision to add a commercial van to his fleet. Choosing the Right Vehicle for Your Business: Commercial Van or Service Truck? When it was time to add a new service vehicle to his fleet of 7 to replace an aging truck, Dennis went straight to his truck builder. “I spec’d out a truck with a crane and was ready to place the order. It was going to cost about $150k, so I decided to compare it to the cost of a commercial van. The van ended up being half the price.” Because of the significant savings, Dennis decided to explore commercial van options. “We chose the Mercedes-Benz Sprinter over the other vans because the Sprinter comes in a 4×4 option, which is necessary when we’re travelling to jobs in remote locations,” says Dennis. Though the additional draw to the service van option was cost, Dennis was aware of other benefits that come with having a van instead of a truck. “The van is a smaller vehicle, which makes it easier to drive and maneuver. We do service jobs right at the docks, so the van is the best option for driving to these marine applications,” notes Dennis. 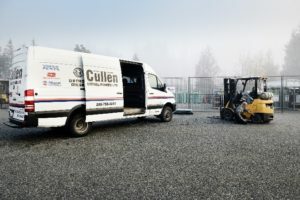 The Cullen Diesel Branch Manager also appreciates the extra level of protection from theft and the elements the enclosed space of the van offers: “Tools and equipment are kept safe inside the van from theft, but also from rain, sleet, ice, and snow. My team also appreciates the enclosed area to store and organize their tools instead of standing around the outside of the truck in all types of weather.” In addition to the cost, size and maneuverability, and enclosed protection from theft and the weather, the van acts as a moving billboard for Cullen as there’s much more advertising space on the van’s body. Overall, the decision to add a commercial van to the Cullen Diesel fleet has had a positive impact on Dennis’ operations. “We’re looking to add another vehicle to the fleet and I want to get another van,” says Dennis. Subscribe to the VMAC Blog to continue reading about Cullen Diesel’s experience with a service van, and the specialized equipment that it comes with. 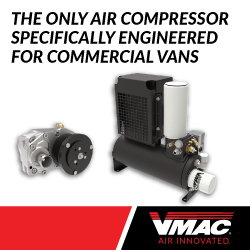 In part two of this series, which will be released next, Dennis will give insight into his decision to choose an UNDERHOOD™ 40 Van Series Air Compressor instead of a standalone gas drive air compressor for his Sprinter.